Guest post by Bon Crowder who blogs at Idearella. While assembling diapers the other morning I noticed I was stacking them next to my Smith & Wesson 9mm handgun. Strangely intrigued by this, it occurred to me how similar cloth diapers are to firearms. Cloth diapers are amazingly absorbent. They are different from the cotton diapers many of us wore on our bums. The hemp and microfiber absorb and hold. The outer layer against the skin provides wicking so the cutie doesn’t feel so much moisture. A pistol not only provides protection, but also confidence. When you walk to the parking lot with a Beretta in your mom-bag, your body language says, “Go ahead, make my day.” This is not what predators are looking for. 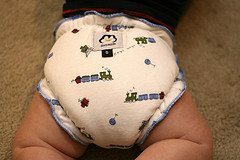 Once you learn the proper assembly of a cloth diaper, they are very easy. 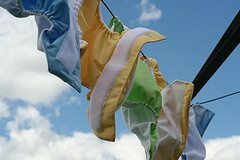 The new technology in cloth diapering provides for the same ease and convenience as disposables. Learn how to shoot a pistol and you’ll never look back. Make sure you take a class from a firing range, though – don’t learn from a friend. The range instructors are great with instilling confidence. They teach the proper methods of shooting as well as the local laws. I’m the only mom in my network that uses cloth. Even my super-green friends use disposable diapers! In some countries you can’t buy firearms. And even in Texas many people are anti-gun. Every mom should carry at least one. Head to the store without a diaper and you’re asking for a blowout! This applies to disposables also, but just try finding your favorite cloth diaper in your local grocery store. It is painful to have to figure out which disposable to buy when your kiddo is screaming and covered in poop. Even when just running into the corner store, carry your pistol (make sure you are fully licensed first). When you least expect it, someone might go postal. So expect it! You can join an association for it. In addition to a gazillion yahoo and google groups, there is also the Real Diaper Association and the National Association of Diaper Services. You can join the National Rifle Association. If you are so inclined, there are many local organizations to join as well. Every state seems to have its own association, too (The Texas State Rifle Association for example). Curiously all these local and state groups are unaffiliated with the NRA. Cloth diapers these days come in two or more parts, depending on the brand. There is an inside part made of hemp or micro fiber called the insert. The outside has a plastic liner, either built in or removable. In my household we call it the “out-sert.” They must be disassembled before cleaning and the reassembled before use. You can buy a pistol in one piece (in fact it is recommended – they aren’t like the old PCs where you can stick them together willy-nilly). All the pieces should be regularly cleaned, so you will have to disassemble and reassemble it after every use. It’s no good unless it is loaded. When heading out, make sure you have both the out-sert and the insert. If you grab the out-sert only in a changing situation, no protection will be provided. Although all cloth diapers are cute, it isn’t for show and will end in disaster if you leave out the money part inside. My rule: “If I pull the pistol, I use the pistol.” Using it for show only serves to get you in trouble. Having an unloaded weapon when you need a weapon is worse than having an unloaded diaper when you need a diaper. Although when you find yourself without a loaded diaper, you will think the opposite. The one you choose is a personal preference. We made the decision to go with gDiapers (three pieces to assemble, Velcro closures). There are many others, most of which are snap closures with only two pieces to assemble. The out-serts for these have to be washed every single time, though, so there is a trade off. The Velcro tends to curl up after a while on the g’s, but you get used to it and compensate. You must be brave to use it. 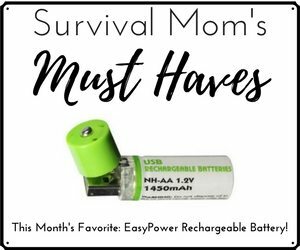 Moms have been using disposables for so long that breaking with the popular trend is a challenge. The first few times you use them is somewhat intimidating. The first few times you wash them is more so. When you muster the courage, the pay off is great. Learning to shoot can be intimidating. If you take the class from a certified instructor at a range, you’ll feel better. Your courage will grow with practice. I’ve yet to have to shoot a bad guy, but I did have four punks looking over my fence recently with a long arm (shotgun or BB gun, it was flashed so quickly I couldn’t tell). I stood at my patio door with pistol in hand ready to shoot any of them if they decided my backyard was a cool place to be. It takes bravery, but it is very empowering. Sometimes you have to leave it behind. One set of Daughter’s grandparents can’t manage with the cloth. They buy disposables for her visits. I have to let it go. Some places are off limits for pistols. Know these places and leave it behind. 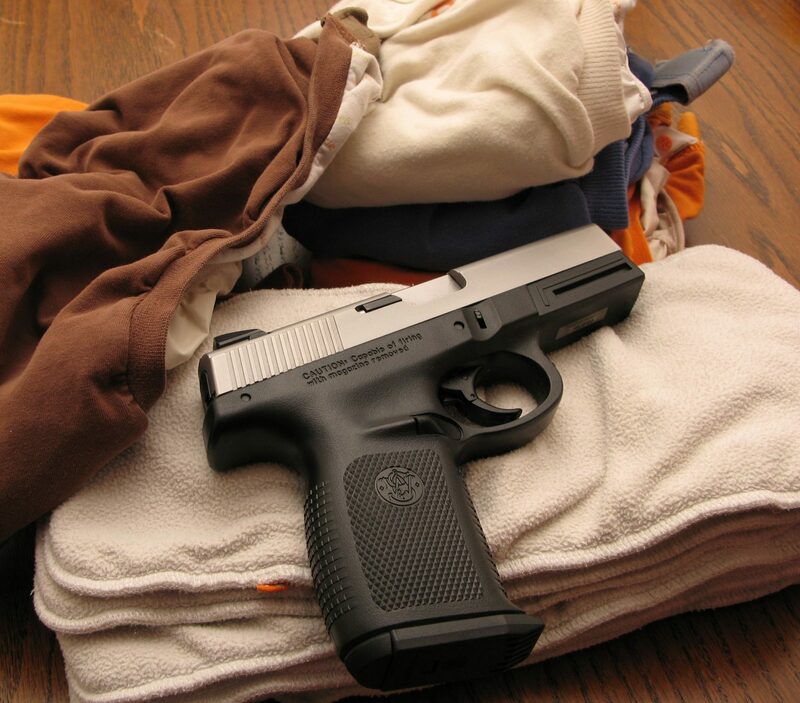 All-carry-all-the-time is a great plan, but get caught with a pistol in an off limit place and you’re in big trouble. A green mom can protect her family. A conservative mom can protect the environment. If it’s for you and if you can muster the courage, make the choice and stick with it. 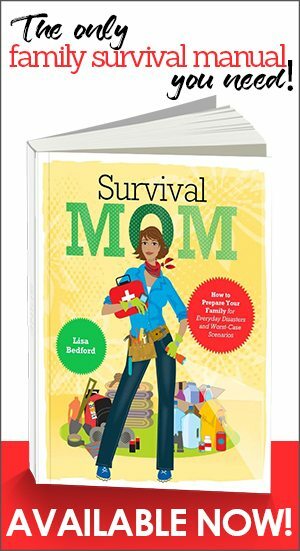 You too can be a tree-hugging, gun toting mom! Bon Crowder is mom to 12-month-old Kate and is licensed to carry a concealed weapon. She writes for Idearella.– creative ways to look at the world differently. Too funny! What a terrific perspective. Although with pistols there's only one kind of dirty. Love the analogy! I have my 4th kid in cloth right now, I've definitely gotten my money's worth out of those diapers. And just like a pistol, you can sell your cloth diapers when you get new ones (or no longer need them). My gDiapers are new, but my S&W is a used one. I'm hoping for kid #2 within the next year or two so I'll be hanging on to the diapers for a bit. Plus I'm emotionally attached to them now. I'll get over that and sell them someday, I'm sure. 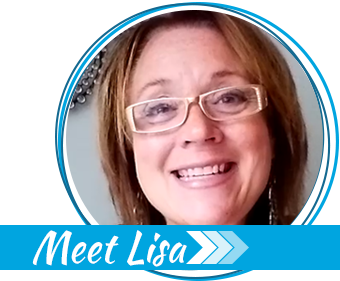 Lisa had us curious about this article, and you did NOT dissapoint! Very good article. Loved the comparisons! It stemmed from Husband asking if we had any "loaded" diapers in Daughter's room. The more I thought about it, the more I was amazed at the comparisons I could come up with! A friend sent me this article saying I'd enjoy this– I did. 🙂 Thanks for sharing this perspective with us. Love the way you think! I'm glad you found my blog! Thanks for dropping by and commenting. Thank you Camille! I hoped readers would enjoy it as much as I did while writing it! What an interesting comparison! It certainly gave this non-gun toting, cloth diapering mama a good laugh. Thanks! Love it! and my cloth diapers, I will have to get the license for the gun I should also be carrying around. My favorite part was about the grandparents. "Some places are off limits for pistols" Very nice 🙂 I stopped trying to bring my pocket diapers to church in favor of the prefolds. Our nursery director can use the prefolds but can't figure out the pockets. This is great! I just received my CCW. I have two kids under 2 and we use GroVia cloth diapers. Hard to find a supportive community for “pistol packin’ mama’s”! That’s awesome! We make our cloth diapers! But we get this expensive cloth, i don’t know a lot about it. Except that the solar setup i made runs the sewing machines! Clever comparisons! Good comic relief for this 64’ish grandma still working full-time – cloth diapers were the only choice for my boys – yellow rubber gloves were my new fashion statement… until the disposables became an option for times like church, outings, etc. Now I use the cloth ones for whatever needs a good mop up. Brings back memories. On the pistol side, my favorite piece is my Gold Cup – shoots straight and true. I appreciate that most places now have concealed carry – after plunging into the CCW fray in KS in the 90’s I understand the flak and what it took to achieve this. 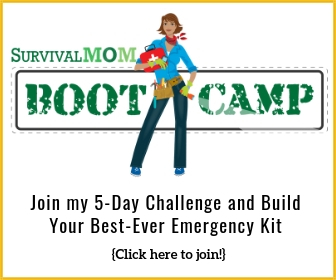 I’m also a preparedness ‘groupie’ and like to follow up on good ideas I read about. Thanks – need to go take care of my fall green bean plantings…! FyI: Just like my weapon I also carry several diapers in my bug out bag as well as my get-home-3day pack. (believe me when I say they have a hundred uses)!!!! Love this post! Hahaha! I’m a cloth diaper blogger and my husband is a gun advocate and custom holster maker. Definitely mention that both have great re-sale value. Gun auctions and cloth diaper auctions both draw big crowds! Remember, treat any gun OR diaper as if it were “loaded”. The consequences can be devastating, though a loaded diaper isn’t usually deadly. I’m a dad. When I unsuspectingly picked up our new born’s loaded diaper, I soon WISHED I was dead. Cloth diapers certainly do hold value!